Food trucks have long been a part of our culinary lexicon, and Walt Disney World has even gotten in on the game for several years now with a rotation of trucks that could be housed at Disney Springs or situated at a resort when there is a refurbishment and additional food offerings are needed. 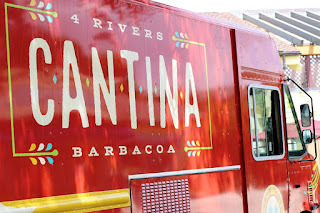 Into this scene enters John Rivers and the 4 Rivers Cantina Barbacoa Food Truck at Disney Spring's Marketplace, and if you think that the name in a mouthful, then just wait until you see what they’re serving out of the truck! Disney has a long and storied history with cone shaped sandwiches and meals. From the earliest days of the Handwich to the more recent bread-based cones popular in California Adventure’s Cars Land, these sandwiches are mobile and can utilize a broader variety of fillings. In the case of 4 Rivers Cantina Barbacoa Food Truck, the main attraction here is also cone based, and is known as the Taco Cone. It comes with your choice of filling, more on that in a minute, along with shredded lettuce, guacamole, Pico de Gallo, queso, sour cream, jalapeño, cilantro, and a wedge of lime in a fried tortilla cone. Your choices for fillings include black beans and rice, grilled tri-tip steak, chicken tinga, brisket barbacoa, or Nana’s pork sofrito. There may be some words in that last sentence that ring a bell for you, and that’s okay, food should be an adventure at times. Barbacoa is the original form of barbecue, tinga is typically a shredded chicken with tomato based sauce, and sofrito is a sauce rich in garlic, onions, tomatoes, and peppers. 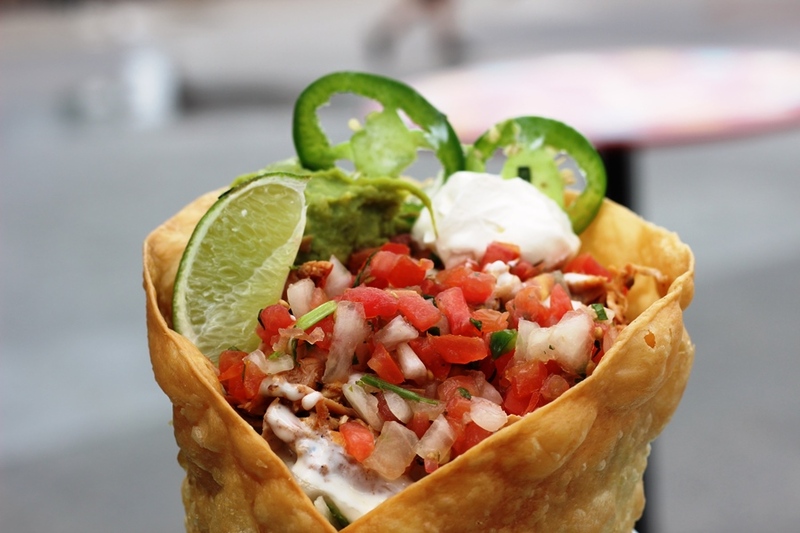 The assembled Taco Cone is larger than my head, and stuffed full of these wonderful flavors. I’ll admit that I assumed once I got through the top layer of my filling of choice, chicken tinga, that there wouldn’t be much of the main attraction to find towards the middle and bottom of the cone, and I was completely wrong. The chicken was prevalent throughout, the queso was thick and bonded everything together, the guacamole and jalapeños provided some nice heat, in addition to adding some fresh flavors when included with the cilantro, lime, and Pico. The chicken itself was moist and flavorful, the way you would expect a really excellent stewed chicken to taste. The taco shell cone was wonderfully crispy, even towards the bottom I didn’t notice any amount of sogginess. I was able to break off portions to use as chips to scoop out some of the filling or just bite into it as I made my way through the cone. The only problem I had with the cone deliver system comes from the other offerings from 4 Rivers Cantina Barbacoa Food Truck. Since the food truck serves bottled, not fountain, drinks, it is almost impossible to open your bottle up while holding your cone since you can’t really put it down. Luckily there were two of us who were able to help each other out, but it was a challenge to figure out. 4 Rivers is a name common around the Orlando area known for its smokehouses and barbecue. 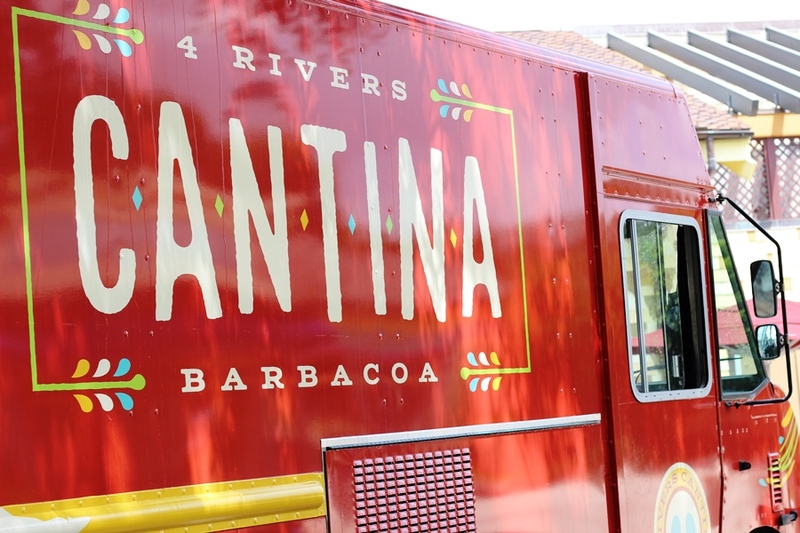 However, since The Polite Pig already had the Disney Springs market on barbecue cornered, it was a chance for John Rivers and the entire 4 Rivers assemblage to stretch their creative culinary skills. The results are delicious, and best sampled for yourself. The Taco Cone is one cone that, due to its size, may give me shame when I finish it, but I like it!